Kumaryasava (also called and spelled as Kumari Asav, Kumari Asava & Kumaryasavam) is an ayurvedic medicine of Asava Arishta category. It is used for the treatment of menstrual disorders in women and abdominal diseases in general. Its main action appears on stomach, intestine, liver, spleen, uterus, ovaries and other organs in the abdomen and pelvis. It is useful in health problems such as loss of appetite, abdominal pain, piles, spleen enlargement, liver enlargement, fatty liver, epilepsy, amenorrhea, and menstrual irregularities. The decoction is prepared using Haritaki and water and reduced to 1/4th (i.e. about 3 Kg liquid). The following herbs and ingredients are added in the decoction after several hours. The mixture of these ingredients is kept in Asava Vessel for 20 to 30 days. Then it is filtered and stored in glass bottles. Kumaryasava (Kumari Asav) is digestive stimulant. In digestion, it mainly affects the liver by causing stimulation in the release of bile from the liver and improving liver functions. This action is attributed to the presence of Aloe Vera, Tamra Bhasma, etc. in this medicine. Its emmenagogue action is due to Aloe Vera, Nardostachys Jatamansi, Plumbago Zeylanica etc., which helps to promote menstrual discharge. In addition, it also affects the ovaries and induces the release of egg. The effects of Kumaryasava (Kumari Asav) are observable on the Vata Dosha and Kapha Dosha, but it may increase the Pitta Dosha because of its hot ingredients like Jaiphal, Chitrak, Pushkarmool, etc. However, the main ingredient i.e. Aloe Vera has SHEETA (cool) potency, but fermentation process and other ingredients potency affect this. We believe it is mainly helpful in cases of increased or aggravated Kapha Dosha in consideration of its indications and mechanism of action. Kumaryasava has action on AMA (toxins). It acts as anti-toxin and detoxifier, so it can be used in all diseases that occur due to AMA accumulation and its increased formation in the body. Kumaryasava acts on digestive juices. It stimulates the secretion of digestive juices from the stomach and pancreas. Another action also appears on the liver and gall bladder from where it also stimulates the release of bile into the intestine and promotes digestion. Therefore, it helps to digest all major nutrients i.e. carbohydrate, fats and proteins. The secretion of digestive juices also stimulates appetite and makes person to feel hungry. It also acts on the mind and cause desire to eat. It improves appetite and promotes desire to eat. It reduces excessive saliva production, burps and heaviness in the abdomen. In poor appetite and anorexia nervosa, it should be started in dosage of 5 ml in children and 10 ml in adults twice daily and the dosage can be increased gradually to 10 ml in children and 20 ml in adults twice daily over the period of 2 to 4 weeks. The therapy should be continued for at least 12 weeks with Kumaryasava. Generally, all Asava and Arishta preparations are recommended to take after meal, but Kumaryasava should be taken 30 minutes before in cases of poor appetite and loss of desire to eat. It should also be noted that patient should not have any problem listed in the contraindications; otherwise, it should not be given. Note: It is very important before prescribing Kumaryasava that patient must not have any tenderness in the abdomen, epigastrium tenderness, gastritis, heartburn and other pitta symptoms. Otherwise, it will worsen the abdominal pain. In these cases, Kamdudha Ras is perfect medicine. Kumaryasava has great influence to prevent and treat fat accumulation on the liver. The possible action of some ingredients in Kumaryasava is to promote the metabolism of accumulated triglycerides and other types of fats. It may also promote the removal of fat from the liver. Some ingredients also have anti-inflammatory action, which is discernible on the liver and gall balder and where Kapha is essentially linked. For better results in Fatty Liver Syndrome, it can be used along with Arogyavardhini Vati, Vasaguluchyadi Kashayam, or Pippali Rasayana or Pippali Churna. Kumaryasava is also beneficial for reducing the size of liver. Generally, it is more beneficial if it is linked with Hepatic Steatosis and may act in same way as discussed above in fatty liver. Kumaryasava acts on peristalsis and appears to be mild stimulant laxative as well. It increases the bile flow to intestines and induces the peristaltic movement. As it corrects the liver functions and modulates the flow of bile from the liver and gall bladder to intestine, it can help in chronic constipation because its effects are long-lasting due to modulation in liver functions. Kumaryasava make the accumulated mucus thinner and helps in the expulsion of the thick sputum with cough. It helps to clears the lungs and reduces the cough attacks. It can be taken by both children as well as adults for this purpose. The dosage should be 5 ml in children and 10 ml in adults twice daily after meal. It should be noted Kumaryasava is contraindicated in bleeding piles, so carefully examine the patient and analyze his history if he has even occasional bleeding. Then it should not be given. In non bleed piles, it reduces the hemorrhoidal mass hardness and gives symptomatic relief from pain and discomfort. Second way to its action is to reduce AMA (toxins), which are believed to cause piles in ayurveda. In ayurveda, Rheumatoid Arthritis seems similar to AMAVATA. This condition occurs due to accumulation of AMA (toxins) in the body. Kumaryasava as anti-toxin, detoxifier and AMA PACHAKA, reduces AMA and aids in relieving symptoms such as joint inflammation, swelling and stiffness. Stiffness with swelling and poor appetite is a main indicating condition to use Kumari Asav. Along with Mahayograj Guggul and Raja Pravartini Vati, Kumaryasava helps to bring on menstruation. It also acts on ovaries and corrects the ovarian functions and induces ovulation. It may also influence female hormones and helps to normalize and balance hormone levels, which may helps bringing on menstrual period. 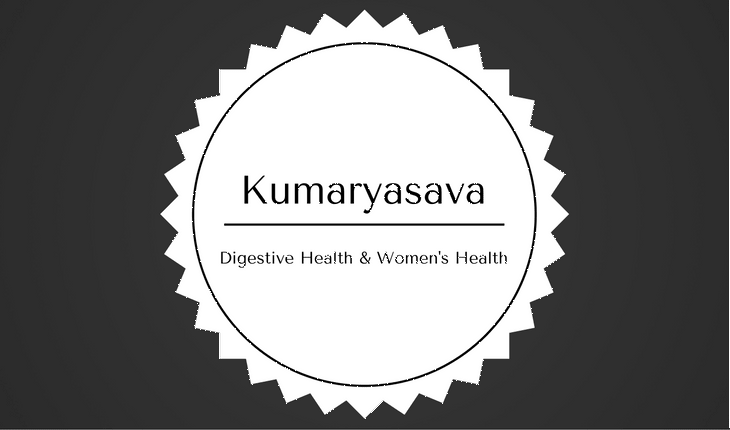 Kumaryasava improves menstrual flow and regulates the menstrual periods. It is beneficial when patient has less bleeding and scanty menstruation. If bleeding is heavy, then Ashokarishta should be used and if bleeding is less, then Kumaryasava is beneficial. Kumaryasava is given in dysmenorrhea (painful periods) if there is no Pitta symptom appears in patient and if patient has less bleeding and scanty period. It improves the menstrual blood flow, increases menstrual bleeding, and reduces unusual uterine contractions significantly, which helps to reduce pain associated with menstruation. On the other hand, if bleeding is heavy, then Ashokarishta is beneficial. The same condition applied here. If patient has less bleeding and scanty period or light menstruation or absent menstruation (amenorrhea), then Kumaryasava along with Mahayograj Guggul, Chandraprabha Vati and Sukumaram Kashayam should be used. Raja Pravartini Vati may also be added if patient has amenorrhea along with PCOS. The general dosage of Kumaryasava (Kumari Asav) is as follows. Kumaryasava (Kumari Asav or Kumaryasavam) should be taken in recommended dosage under professional supervision. In high dosage, it may cause side effects as discussed below. Bleeding piles: However, it is used in the management of piles, but it is contraindicated in bleeding piles and other bleeding disorders. This side effect appears when Kumaryasava is taken in high amount i.e. more than 50 ml per day. But if patient has Pitta Body type or other pitta conditions, then this side effect can also occur with lower dosage as well. Green Discoloration of Stool: It is very rare side effect. Mild Abdominal Cramps during bowel movement: Like other laxatives, Kumaryasava may cause mild abdominal cramp or pain during defecation. It is also very rare side effect of Kumari Asava. Discomfort feeling in urinary bladder and urethra: In high dosage, Kumaryasava can cause feeling of discomfort in the urinary bladder and urethra. Nephritis (inflammation of kidneys): This side effect is also very rare and can occur only with high dosage. Kumaryasava (Kumari Asav) should not be taken during pregnancy because of its emmenagogue action, so it may promote bleeding and may lead to miscarriage. During lactation, it should also be taken only if recommended by ayurvedic physician, according to the health condition. Can we use Kumaryasava in old age for fatty liver? Kumari Asav is really helpful for fatty liver and can also be used in elderly people. It can be used along with Arogyavardhini Vati for best results. Is it safe to take Kumaryasavam if prolactin level is high and PCOD with absent Menses? Yes, Kumaryasava should be safe in such case as well. Can I take Kumari asava when trying to conceive, as I have very irregular periods and take almost more than a month to 2 months sometimes for getting a period? Also from the blood test which my gynecologist did for PCOS, I was detected to be on the pre-diabetic borderline, but not taking any hormonal pills. The doctor said you can do regular exercise and eat a healthy diet. So would Kumari asav help me with this condition? And what should the quantity for kumari asav to be taken in a day and how many times? Any medicine containing Aloe Vera including Kumari Asava is not suggestible during pregnancy or when you trying to conceive. It can cause uterine contractions. However, how does it affect pregnancy depends on its dosage. You can use it, in recommended dosage under supervision of an ayurvedic doctor, as long as you do not become pregnant. You require to stop it immediately after confirmation of pregnancy. For more details, please consult a local ayurvedic physician because he/she can understand your situation better and suggest you better options. I have severe acidity,severe gas, burning sensation, Sometimes abdominal pain.The Kumaryasava is recommended for this or not? Hi, I had multiple ovarian cysts last year and with homeopathic treatment it was dissolved but now again multiple cysts is showing in my reports. Last year I had gallbladder surgery. I have prolong periods with normal bleeding. Should I take ashokarishta with kumaryasava. My daughter is 18 years old and she is not having proper periods. Her periods are delayed by 2 months, recently I am giving her ashokarishta and Dashmularishta in morning and turmeric milk in night, please help me for the same. Ashokarishta is not suitable in such cases. It is contraindicated in delayed mensuration or light periods. Dashmoolarishta is also not required in this case. Kumaryasava along with Maha Yograj Guggul or Bang Bhasma is a drug of choice for absent periods, delayed mensuration or light periods. However, Kasisadi Vati (also called Raja Pravartini Vati) or Agnitundi Vati may also require in severe cases. All these medicines should be taken under the supervision of physician. We don’t have any ayurvedic dr and allopathic dr do not encourage this type of medicines. Can you guide me how to take medicines kumaryasava and maha yog raj guggul, how many times a day? Dosage is given in the article. Generally, these medicines are required twice daily. Both medicines are described in Ayurveda (Indian Medicine System). Kumaryasava is likely safe to consume. Maha Yograj Guggulu should be used under the supervision of ayurvedic physician. Can I give turmeric milk in the night after giving her Kumaryasava and maha yog raj guggul and what should be time duration? Yes, turmeric milk can be taken at night. Just keep 45 minutes gap from Kumaryasava. If bleeding is not heavy, then there is no need to stop. Her acne problem white discharge and back pain is reduced alot only problem is with delay menses. You should wait and continue medicines as prescribed for 1 to 2 weeks. Please consult any physician. You may require different medicines. Sir I don’t have any ayurvedic physician please help me for the same, will be grateful to you, as I am believer of ayurveda. I consulted an Ayurvedic doctor recently and was prescribed Kumarasyavam together with Varanadi Kashayam (morning), and Sukumaran Kashayam with Lohasavam (night). I have fibroids and suffer from anemia due to heavy menstrual bleeding. About a year ago I was prescribed Ashokarishtam with Sukumaran Kashayam, and Lohasavam by another doctor. After reading all the useful information here, I’m having doubts about which is better for me (Ashokarishtam or Kumarasyavam). I am a mother of two. Please advise. Thank you very much. If you have heavy bleeding, Kumaryasava might not be suitable. Ashokarishta should be given in this case. Please discuss all these with your doctor. He may advise you better.